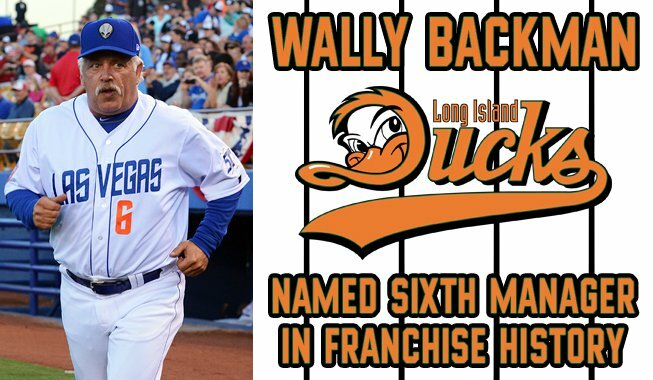 The Long Island Ducks are ready to play "Wally Ball." Their hiring of Wally Backman to manage the club generated both local and national headlines, but for those who actually follow the Atlantic League, the storylines were far more complex than the typical clickbait about the scrappy 59-year-old finally getting to be a skipper in "New York." Backman landing in Long Island was part of a unique managerial musical chairs that started when Kevin Baez took the Rockland job and ended when Jamie Keefe, who held that position, was named as the High Point Rockers inaugural manager. As it turns out, the "Ducks were planning on bringing in Backman from the Bees the whole time" speculation didn't have much foundation to it. "It all kind of transpired pretty quick," Backman told MyCentralJersey.com in a lengthy phone conversation. "I had a few talks with the Mets, and it got to the point where I had to make a decision, but then I got a call that Kevin was leaving and going to Rockland and would I come there. It happened real fast." Backman was asked if it was at all difficult to leave a potential job with the Mets organization, one which he did not expand on, on the table to take the Ducks gig, and largely danced around that while choosing to praise the organization and the league that convinced him to make this move instead. "If something was to happen -- coaches, players, they're able to get out for whatever it might be -- but the Long Island people were the ones who really turned me on to the (Atlantic) League last year," Backman said. "I was excited about the league. New Britain didn't draw the way we wanted them to draw. We had a decent product on the field, we (moved) players like we're supposed to. We fell short. We had a real good run at (Somerset) actually, but we finished a couple games behind in that first half, and then we lost a few more guys in the second half which really hurt us. But I like the way the league is run, there's good people who run the league that care about the game. We all care about winning, but they care about the game and they care about the players. I'd done an independent league earlier in my career, and it wasn't bad, but I just thought with how the league operates and with Rick White being the commissioner and getting to know him, there's just good people throughout the whole league. We all know that Long Island, Somerset, Sugar Land, those are the three most exciting places to go. So, to be able to go to Long Island was big. And I have a relationship with them too, so I'm excited for it." Backman inherits a close-but-no-cigar Ducks roster that had gone to the Championship Series three straight times under Baez's tutelage, but come up short. A consistent, hard-working group of veterans has largely been responsible for getting Long Island that far each year, but with Baez now out of the picture, it remains unclear what Backman's version of a Ducks roster will look like. "I've thought about it a little bit," he said. "I haven't really looked at the roster and gone over it with (GM) Mike (Pfaff) closely yet. Mike and I agree on a few things. We're probably going to have quite a bit of turnover. They went to the championship and everything last year, but my philosophy with it is that you've got to keep players hungry. You have players that are there that are meant to be there and are determined to win, and then you have players in the league that want to get exposed so they can get back to affiliated ball or move on overseas. I think keeping players hungry makes you a better ballclub. To stay stagnant and take the players you've had every single year and try to let them return is something I don't think either Mike or I think we should do. We should have turnover, try to bring new faces into the league. They've done that in the past, and the league has done that in the past." Backman, who had a lengthy big league career as a player and was a big part of the Mets championship team in 1986, is hopeful that he can be a part of getting the Ducks franchise back to the promised land once again, but knows that'll be a much bigger challenge with the Atlantic League getting even stronger this year. "The Ducks have got a long history, like Somerset, where they get to the playoffs," he said. "There's only going to be one winner every year, and usually whoever gets hot at the end of the year is the one that wins it. I'm hoping I can bring in that extra little piece to try to get Long Island over the hump. But, it's going to be tough. With High Point coming into the league, they've got a good coaching staff; Jamie Keefe, he's played for me, and he's a baseball guy. We tried to get to Frank Viola to come to Long Island, but he only lives 50 minutes away from High Point so it didn't happen. They've got a good staff. So, they're not going to be like the Road Warriors, a team where you think you can go in and win three out of four every time you play them. I think the league has gotten better, and in time it'll get even better because they're trying to add some good teams. This is by far the best independent league I've ever been in. I did the Northern League, the Western League...to come here and see the way it's run and the people that are involved, it's a good league. The best part is you don't have to do reports like you would if you were in the minor leagues." So, about that. That freedom of not having to file reports or not having playing time or pitching dictated by a big league front office has always been appealing to Backman, who was able to keep a New Britain Bees team that was on a tight budget and decimated by player signings competitive for nearly of all last season. Backman, without being asked about it, brought up the controversy with Brandon Nimmo that many attributed to why he got let go by the Mets organization in the first place as an example of that freedom. "One of the deals I had was that I wasn't hitting Brandon Nimmo enough at the top of the order," he recalled. "I had to go through all the stats, which I had, where he'd hit first or second in games 80-some times and a few times down at the bottom of the order. You're trying to protect players. Brandon was a big prospect with the Mets, but when a tough left-hander was pitching, I'd move him down to the bottom of the order. I knew he'd only get three at-bats, and if he got one hit, he was hitting .333. That's a lot better than going 1-for-4 and hitting .250. You try to protect guys to some extent. There's certain guys you had to play and hit them in certain spots in the order in the minor leagues, and that's just the way development is in affiliated baseball, and that part is never going to change. At this level, you're playing to win. You're playing like a major-league team is. We're all going to lose players...it's just hard for us, when it's July and you're selling a player to Mexico or back to an affiliated team, it's hard to replace those players." Let's get the other Wally stereotype out of the way too; that he's the guy you see in the YouTube clips, the guy who's just looking to be a part of a crazy ejection. If that's all you've seen, perhaps that's what your perception of him is. But if you know the league? If you really know Wally? "I'm a players guy; I care about my players and I protect my players," he said. "I do what the organization wants. Here, you have a lot more leniency because you get to call the shots on the field. You're responsible for the wins and the losses. You have to respect your players, you have to respect the front office, you just have to respect the game. If you do all those things, everything flows pretty good." Ultimately, if there's anything Wally cares about, it's winning, and that's his focus now that he's with the Ducks. "I'm going to have a lot of help with Mike," he said. "We're going to put a good product on the field. We're not in any hurry whatsoever to go after players right now. There's going to be a lot of players that get released or have had injuries, and those guys won't be available until March. We may have a shorter roster than anybody else until the end. I have plenty of connections like Mike does. The first thing Mike and I will do is talk about the current players on the roster. If there's players that we don't feel like we want to keep, I don't want to hold them back and wait until February and say we're not going to have you. They can find a job right away. We're going to have some turnover, but we're going to keep some of the players as well. How many, I couldn't really tell you. But there's going to be a pretty good turnover in Long Island this year."